The clocks have changed, and Autumn is starting to give way to Winter. With it comes colder temperatures and more pressures on our roads. Making sure that highway surfacing is in its strongest condition for the season ahead can be achieved by using BituChem products and knowledge. It is inevitable that with the number of vehicles on the road today and the Winter elements around the corner, that road preservation is essential in all weathers. 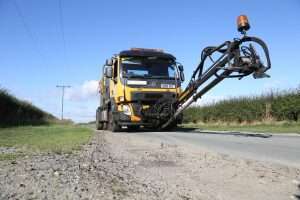 Be it a major overhaul of the surface layer or a series of minor repairs, here at BituChem we boast comprehensive products and expertise in highway surfacing. Across the United Kingdom, both major and minor roads have all benefited from being repaired or resurfaced using BituChem. Protecting the top layer of road against excessive water requires the layer of waterproofing to act as the first line of defence. It is a vital preventative measure; should water penetrate, it is at risk of settling and freezing in cold weather. This will expand and create a split or a pothole. Left unattended the damage will be exacerbated by heavy traffic, leading to the need for more extensive and costly repairs. There will also be a compromise for road safety and it is well documented that vehicles have experienced damage to axles, suspensions and buckled wheels in extreme cases. According to the RAC at the end of June 2018, there were 38.2 million vehicles licensed for use on the roads in Great Britain, of which 31.5 million were cars. Keeping all these vehicles moving safely requires expert applications of highway surfacing solutions. BituChem has a collection of highway preservation products to ensure new and existing roads are kept in their optimum working order. To discuss the requirements of your Local Authority, please contact us today.